Time for another topic from the Lav archives. This one revolves around a most interesting tidbit on Rockman’s first helper robot in 2008’s R20 Official Complete Works book: early concept art showing an early draft of Rush, as well as a hawk-like bird said to have been considered for the supporter role around the same time. Dog… or Bird…? Choose one. 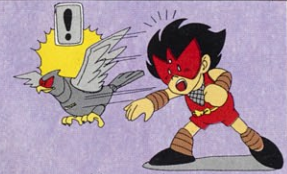 I mused a little on how different it might feel for Rockman to have a pet falcon back when I discussed Rockman’s bird concept in 2011, but only after writing it did I learn that this bird made it quite a few stages past the ol’ drawing board. and his trusty robot falcon Takamaru. 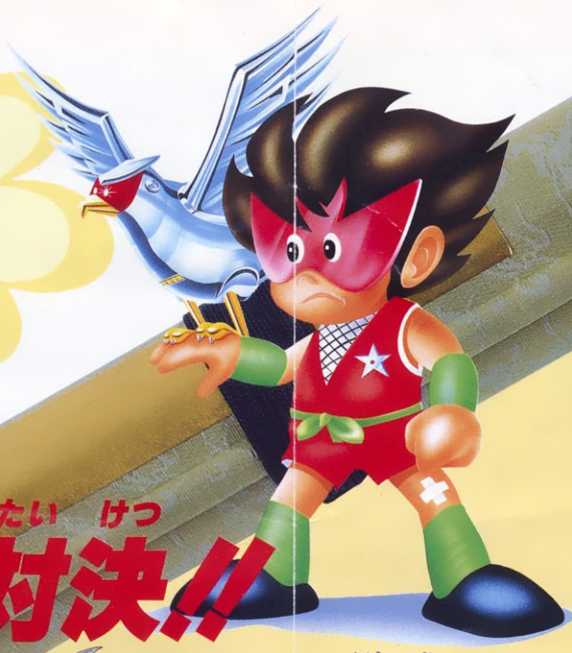 Kamen no Ninja Hanamaru (Masked Ninja Hanamaru) is a 1990 Capcom video game that is perhaps most famous to English speakers for being the game that got turned into Yo! Noid starring the then-mascot of the Domino’s Pizza chain. Hanamaru means flower circle, which is basically the Japanese equivalent of a primary teacher putting a gold star or smiley face on an assignment you did really well on (which the game also awards you for doing well on stages). 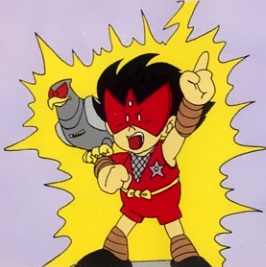 Hanamaru was inspired by the manga, anime and live-action tokusatsu TV show hero of the sixties and seventies, Kamen no Ninja Akakage (Masked Ninja Red Shadow). It was a franchise that helped pave the way for brightly-colored super-hero ninjas with James Bond level super-spy gadgetry. In this game, Hanamaru is a young ninja-in-training out to save a bunch of children who are being held in a theme park that was taken over by a rowdy clan of techno-ninjas. The adventure brings all of Hanamaru’s ninja training and rad 80’s skateboarding skills to bare, but luckily he has an ace up his sleeve — or should I say on his sleeve? 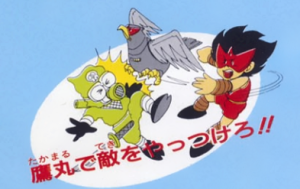 The robotic bird of prey Takamaru (“taka” meaning “hawk” in Japanese). Takamaru is actually Hanamaru’s primary method of attack in the game, with the secondary being a limited screen-clearing lightning attack. Sent out from his perch on Hanamaru’s arm, Takamaru swoops forward to knock out enemies, uncover hidden items, or destroy projectiles before looping back to his master’s side. When Hanamaru jumps, Takamaru hangs tight and flaps his wings to help achieve greater air. There are even aerial stages where Takamaru must fly through the entire area while carrying Hanamaru in segments that become more like jump-based obstacle courses. Takamaru can’t fight and fly at the same time, so the duo must rely on stealth and agility to soar past their enemies’ deadly traps. There are no developer credits at the end of the game, but just looking at the style and the Rockman-like proportions on Hanamaru, it’s easy to guess that Keiji Inafune played a big part in the art direction. Takamaru himself is only a few detail changes away from the prototype falcon image in R20, just sharpen the eyes and elongate the top of the head a little, divide the metal feathers into two rows and move the rectangles to a single bar across its breast; everything else is the same right down to the curve of the beak to the round notch on the wings to the fan of the tail and shape of the claws. 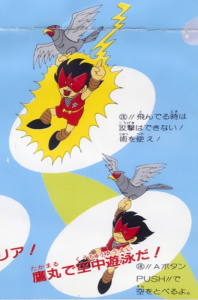 The special image made for the box art gives Takamaru little Rockman-like ears, too. But the real kicker is that Hanamaru’s game came out in Japan on March 16, 1990 — that’s a full 6 months before Rockman 3‘s release. Takamaru made his game debut half a year before Rush! 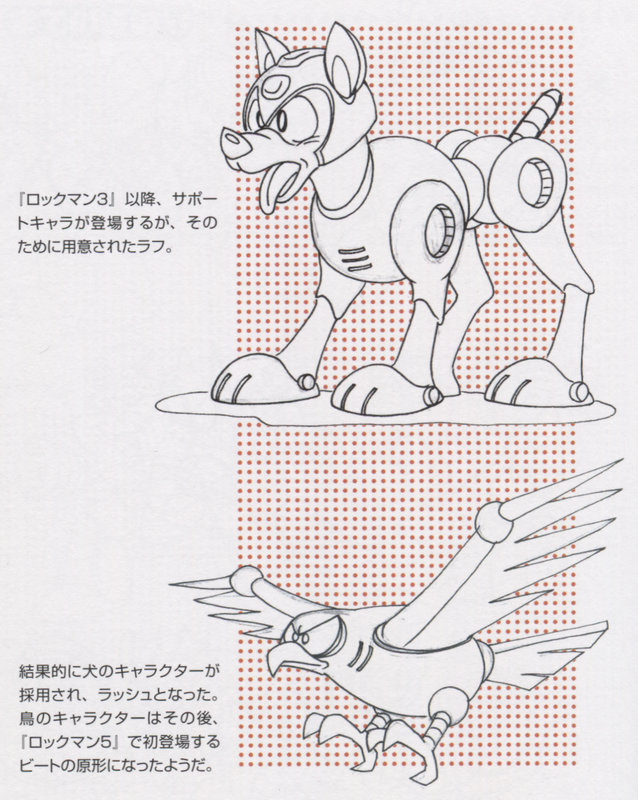 The earliest Rush news in video game magazines (that I know of) were published in the Summer of 1990, but Rush’s concept must have been around near the beginning that year if the rejected hawk design was re-purposed as Takamaru. 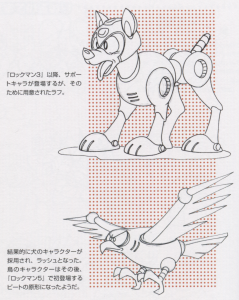 As further possible evidence, the Rockman 1 & 2 team’s project leader Akira Kitamura has said in a 2011 interview that the decision to give Rockman a robot dog was already made before he left Capcom, so it could well be that Rush came about very early in the development cycle and his birdie competition adapted into another project. Takamaru — Once a Mega Hawk? Special thanks owed to Video Game Den for their great review of Kamen no Ninja Hanamaru and for hosting a scan of the game’s manual where I took all this artwork from. 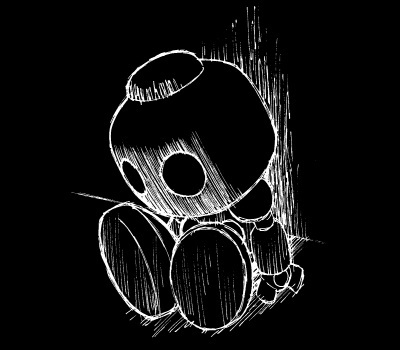 There’s a great perfect run of the game here and a translated playthrough here on YouTube. Take a look and and it’s easy to imagine what Rush as a falcon might have been. Incidentally, Hanamaru can also use a pogo stick power up that’s way more useful than Quint’s Sakugarne, but I’m trying not to read into that one too much. 1 Comment to "The Familiar Familiar"
Dude, easily this game can be turned in a chinese bootleg game, “Ninja Mega Man”. « Food for the troops!